In Part 1 and Part 2 of this series on app discovery, we discussed using machine learning to gain a deeper understanding of the topics associated with an app, and a deep learning framework to provide personalized recommendations. In this post, we discuss a machine learning approach to fight spam and abuse on apps section of the Google Play Store, making it a safe and trusted app platform for more than a billion Android users. With apps becoming an increasingly important part of people’s professional and personal lives, we realize that it is critical to make sure that 1) the apps found on Google Play are safe, and 2) the information presented to you about the apps is both authentic and unbiased. With more than 1 million apps in our catalog, and a significant number of new apps introduced everyday, we needed to develop scalable methods to identify bad actors accurately and swiftly. To tackle this problem, we take a two-pronged approach, both employing various machine learning techniques to help fight against spam and abuse at scale. As mentioned in Google Play Developer Policy, we don’t allow listing of malicious, offensive, or illegal apps. Despite such policy, there are always a small number of bad actors who attempt to publish apps that prey on users. Finding the apps that violate our policy among the vast app catalog is not a trivial problem, especially when there are tens of thousands of apps being submitted each day. This is why we embraced machine learning techniques in assessing policy violations and potential risks an app may pose to its potential users. We use various techniques such as text analysis with word embedding with large probabilistic networks, image understanding with Google Brain, and static and dynamic analysis of the APK binary. These individual techniques are aimed to detect specific violations (e.g., restricted content, privacy and security, intellectual property, user deception), in a more systematic and reliable way compared to manual reviews. Apps that are flagged by our algorithms either gets sent back to the developers for addressing the detected issues, or are ‘quarantined’ until we can verify its safety and/or clears it of potential violations. Because of this app review process combining analyses by human experts and algorithms, developers can take necessary actions (e.g., iterate or publish) within a few hours of app submission. 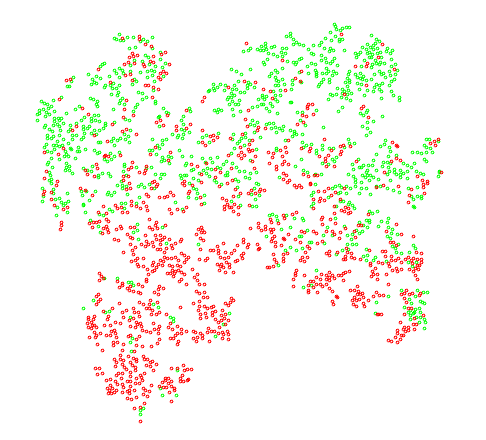 Visualization of word embedding of samples of offensive content policy violating apps (red dots) and policy compliant apps (green dots), visualized with t-SNE (t-Distributed Stochastic Neighbor Embedding). While an app may itself be legitimate, some bad actors may attempt to create fake engagements in order to manipulate an app’s ratings and rankings. In order to provide our users with an accurate reflection of the app’s perceived quality, we work to nullify these attempts. However, as we place countermeasures against these efforts, the actors behind the manipulation attempts change and adapt their behaviors to bypass our countermeasures thereby presenting us with an adversarial problem. As such, instead of using a conventional supervised learning approach (as we did in the ‘Part 1’ or ‘Part 2’ of this series, which are more ‘stationary’ problems), we needed to develop a repeatable process that allowed us the same (if not more) agility that bad actors have. We achieved this by using a hybrid strategy that utilizes unsupervised learning techniques to generate training data which in turn feeds into a model built on traditional supervised learning techniques. Utilizing data on interactions, transactions, and behaviors occurring on the Google Play platform, we apply anomaly detection techniques to identify apps that are targeted by fake engagements. For example, a suspected app may have all its engagement originating from a single data center, whereas an app with organic engagement will have its engagement originating from a healthy distribution of sources. We then use these apps to isolate actors who collude or orchestrate to manipulate ratings and rankings, who in turn are used as training data to build a model that identifies similar actors. This model, built using supervised learning techniques, is then used to expand coverage and nullify fake engagements across Google Play Apps platform. 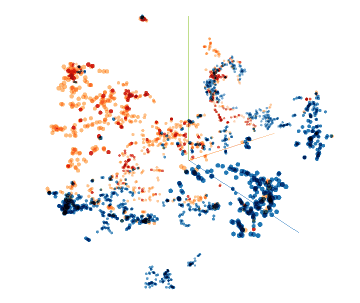 A visualization of how a model trained on known bad actors (red) expands coverage to detect similar bad actors (orange) while ignoring organic users (blue). We strive to make Google Play the best platform for both developers and users, by enabling fast publication while not compromising user safety. The machine learning capabilities mentioned above helped us achieve both, and we’ll continue to innovate on these techniques to ensure we keep our users safe from spam and abuse. This work was done in close collaboration with Yang Zhang, Zhikun Wang, Gengxin Miao, Liam MacDermed, Dev Manuel, Daniel Peddity, Yi Li, Kazushi Nagayama, Sid Chahar, and Xinyu Cheng. There are many hundreds of data repositories on the Web, providing access to tens of thousands—or millions—of datasets. National and regional governments, scientific publishers and consortia, commercial data providers, and others publish data for fields ranging from social science to life science to high-energy physics to climate science and more. Access to this data is critical to facilitating reproducibility of research results, enabling scientists to build on others’ work, and providing data journalists easier access to information and its provenance. For these reasons, many publishers and funding agencies now require that scientists make their research data available publicly. However, due to the volume of data repositories available on the Web, it can be extremely difficult to determine not only where is the dataset that has the information that you are looking for, but also the veracity or provenance of that information. Yet, there is no reason why searching for datasets shouldn’t be as easy as searching for recipes, or jobs, or movies. These types of searches are often open-ended ones, where some structure over the search space makes the exploration and serendipitous discovery possible. To provide better discovery and rich content for books, movies, events, recipes, reviews and a number of other content categories with Google Search, we rely on structured data that content providers embed in their sites using schema.org vocabulary. To facilitate similar capabilities for datasets, we have recently published new guidelines to help data providers describe their datasets in a structured way, enabling Google and others to link this structured metadata with information describing locations, scientific publications, or even Knowledge Graph, facilitating data discovery for others. We hope that this metadata will help us improve the discovery and reuse of public datasets on the Web for everybody. The schema.org approach for describing datasets is based on an effort recently standardized at W3C (the Data Catalog Vocabulary), which we expect will be a foundation for future elaborations and improvements to dataset description. While these industry discussions are evolving, we are confident that the standards that already exist today provide a solid basis for building a data ecosystem. Defining more consistently what constitutes a dataset: For example, is a single table a dataset? What about a collection of related tables? What about a protein sequence? A set of images? An API that provides access to data? We hope that a better understanding of what a dataset is will emerge as we gain more experience with how data providers define, describe, and use data. Identifying datasets: Ideally, datasets should have permanent identifiers conforming to some well known scheme that enables us to identify them uniquely, but often they don’t. Is a URL for the metadata page a good identifier? Can there be multiple identifiers? Is there a primary one? Relating datasets to each other: When are two records describing a dataset “the same” (for instance, if one repository copies metadata from another )? What if an aggregator provides more metadata about the same dataset or cleans the data in some useful way? We are working on clarifying and defining these relationships, but it is likely that consumers of metadata will have to assume that many data providers are using these predicates imprecisely and need to be tolerant of that. Propagating metadata between related datasets: How much of the metadata can we propagate among related datasets? For instance, we can probably propagate provenance information from a composite dataset to the datasets that it contains. But how much does the metadata “degrade” with such propagation? We expect the answer to be different depending on the application: metadata for search applications may be less precise than, say, for data integration. Describing content of datasets: How much of the dataset content should we describe to enable support for queries similar to those used in Explore for Docs, Sheets and Slides, or other exploration and reuse of the content of the datasets (where license terms allow, of course)? How can we efficiently use content descriptions that providers already describe in a declarative way using W3C standards for describing semantics of Web resources and linked data? In addition to the technical and social challenges that we’ve just listed, many remaining research challenges touch on longer term open-ended research: Many datasets are described in unstructured way, in captions, figures, and tables of scientific papers and other documents. We can build on other promising efforts to extract this metadata. While we have a reasonable handle on ranking in the content of Web search, ranking datasets is often a challenging problem: we don’t know yet if the same signals that work for ranking Web pages will work equally well for ranking datasets. In the cases where the dataset content is public and available, we may be able to extract additional semantics about the dataset, for example, by learning the types of values in different fields. Indeed, can we understand the content enough to enable data integration and discovery of related resources? For data providers, both individual providers and data repositories: publishing structured metadata using schema.org, DCAT, CSVW, and other community standards will make this metadata available for others to discover and use. For data consumers (from scientists to data journalists and more): citing data properly, much as we cite scientific publications (see, for example, a recently proposed approach). For developers: to contribute to expanding schema.org metadata for datasets, providing domain-specific vocabularies, as well as working on tools and applications that consume this rich metadata. Our ultimate goal is to help foster an ecosystem for publishing, consuming and discovering datasets. As such, this ecosystem would include data publishers, aggregators (in the form of large data repositories that provide additional value by cleaning and reconciling metadata), search engines that enable data discovery of the data, and, most important, data consumers. Understanding the various meanings of a particular word in text is key to understanding language. For example, in the sentence “he will receive stock in the reorganized company”, we know that “stock” refers to “the capital raised by a business or corporation through the issue and subscription of shares” as defined in the New Oxford American Dictionary (NOAD), based on the context. However, there are more than 10 other definitions for “stock” in NOAD, ranging from “goods in a store”to “a medieval device for punishment”. For a computer algorithm, distinguishing between these meanings is so difficult that it has been described as “AI-complete” in the past (Navigli, 2009; Ide and Veronis 1998; Mallery 1988). In order to help further progress on this challenge, we’re happy to announce the release of word-sense annotations on the popular MASC and SemCor datasets, manually annotated with senses from the NOAD. We’re also releasing mappings from the NOAD senses to English Wordnet, which is more commonly used by the research community. This is one of the largest releases of fully sense-annotated English corpora. Humans distinguish between meanings of words in text easily because we have access to an enormous amount of common-sense knowledge about how the world works, and how this connects to language. For an example of the difficulty, “[stock] in a business” implies the financial sense, but “[stock] in a bodega” is more likely to refer to goods on the shelves of a store, even though a bodega is a kind of business. Acquiring sufficient knowledge in a form that a machine can use, and then applying it to understanding the words in text, is a challenge. Facilitating the automatic construction of databases from text in order to answer questions and connect knowledge in documents. For example, understanding that a “hemi engine” is a kind of automotive machinery, and a “locomotive engine” is a kind of train, or that “Kanye West is a star” implies that he is a celebrity, but “Sirius is a star” implies that it is an astronomical object. Disambiguating words in queries, so that results for “date palm” and “date night” or “web spam” and “spam recipe” can have distinct interpretations for different senses, and documents returned from a query have the same meaning that is implied by the query. In the manually labeled data sets that we are releasing, each sense annotation is labeled by five raters. To ensure high quality of the sense annotation, raters are first trained with gold annotations, which were labeled by experienced linguists in a separate pilot study before the annotation task. The figure below shows an example of a rater’s work page in our annotation tool. 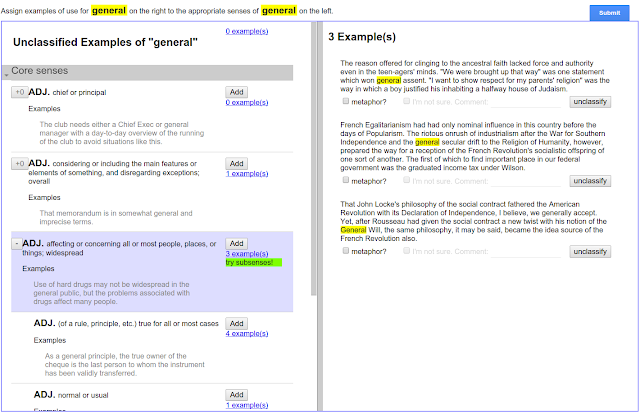 The left side of the page lists all candidate dictionary senses (in this case, the word “general”). Example sentences from the dictionary are also provided. 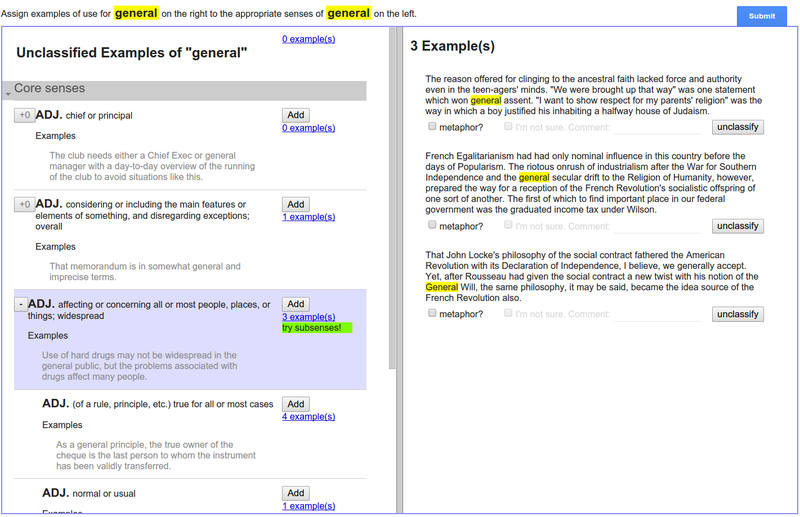 The to-be-annotated words, highlighted within a sentence, are shown on the right side of the work page. Besides linking a dictionary sense to a word, raters could also label one of the three exceptions: (1) The word is a typo (2) None of the above and (3) I can’t decide. Raters could also check whether the word usage is a metaphor and leave comments. The sense annotation task used for this data release achieves an inter-rater reliability score of 0.869 using Krippendorff's alpha (α >= 0.67 is considered an acceptable level of reproducibility, and α >= 0.80 is considered a highly reproducible result) (Krippendorff, 2004). Annotation counts are listed below. We’ve also included two sets of mappings from NOAD to Wordnet. A smaller set of 2200 words was manually mapped in a process similar to the sense annotations described above, and a larger set was created algorithmically. Together, these mappings allow for resources in Wordnet to be applied to this NOAD corpus, and for systems built using Wordnet to be evaluated using this corpus. You can learn more about our full research results on this corpus using LSTM-based language models and semi-supervised learning in “Semi-supervised Word Sense Disambiguation with Neural Models”. The datasets were built with help from Eric Altendorf, Heng Chen, Jutta Degener, Ryan Doherty, David Huynh, Ji Li, Julian Richardson and Binbin Ruan. The Google Brain team's long-term goal is to create more intelligent software and systems that improve people's lives, which we pursue through both pure and applied research in a variety of different domains. And while this is obviously a long-term goal, we would like to take a step back and look at some of the progress our team has made over the past year, and share what we feel may be in store for 2017. One important way in which we assess the quality of our research is through publications in top tier international machine learning venues like ICML, NIPS, and ICLR. Last year our team had a total of 27 accepted papers at these venues, covering a wide ranging set of topics including program synthesis, knowledge transfer from one network to another, distributed training of machine learning models, generative models for language, unsupervised learning for robotics, automated theorem proving, better theoretical understanding of neural networks, algorithms for improved reinforcement learning, and many others. We also had numerous other papers accepted at conferences in fields such as natural language processing (ACL, CoNNL), speech (ICASSP), vision (CVPR), robotics (ISER), and computer systems (OSDI). Our group has also submitted 34 papers to the upcoming ICLR 2017, a top venue for cutting-edge deep learning research. You can learn more about our work in our list of papers, here. Allowing computers to better understand human language is one key area for our research. In late 2014, three Brain team researchers published a paper on Sequence to Sequence Learning with Neural Networks, and demonstrated that the approach could be used for machine translation. In 2015, we showed that this this approach could also be used for generating captions for images, parsing sentences, and solving computational geometry problems. In 2016, this previous research (plus many enhancements) culminated in Brain team members worked closely with members of the Google Translate team to wholly replace the translation algorithms powering Google Translate with a completely end-to-end learned system (research paper). This new system closed the gap between the old system and human quality translations by up to 85% for some language pairs. A few weeks later, we showed how the system could do “zero-shot translation”, learning to translate between languages for which it had never seen example sentence pairs (research paper). This system is now deployed on the production Google Translate service for a growing number of language pairs, giving our users higher quality translations and allowing people to communicate more effectively across language barriers. Gideon Lewis-Kraus documented this translation effort (along with the history of deep learning and the history of the Google Brain team) in “The Great A.I. Awakening”, an in-depth article that appeared in The NY Times Magazine in December, 2016. Traditional robotics control algorithms are carefully and painstakingly hand-programmed, and therefore embodying robots with new capabilities is often a very laborious process. We believe that having robots automatically learn to acquire new skills through machine learning is a better approach. Last year, we collaborated with researchers at [X] to demonstrate how robotic arms could learn hand-eye coordination, pooling their experiences to teach themselves more quickly (research paper). Our robots made about 800,000 grasping attempts during this research. Later in the year, we explored three possible ways for robots to learn new skills, through reinforcement learning, through their own interaction with objects, and through human demonstrations. We’re continuing to build on this work in our goals for making robots that are able to flexibly and readily learn new tasks and operate in messy, real-world environments. To help other robotics researchers, we have made multiple robotics datasets publicly available. We are excited by the potential to use machine learning to augment the abilities of doctors and healthcare practitioners. As just one example of the possibilities, in a paper published in the Journal of the American Medical Association (JAMA), we demonstrated that a machine-learning driven system for diagnosing diabetic retinopathy from a retinal image could perform on-par with board-certified ophthalmologists. With more than 400 million people at risk for blindness if early symptoms of diabetic retinopathy go undetected, but too few ophthalmologists to perform the necessary screening in many countries, this technology could help ensure that more people receive the proper screening. We are also doing work in other medical imaging domains, as well as investigating the use of machine learning for other kinds of medical prediction tasks. We believe that machine learning can improve the quality and efficiency of the healthcare experience for doctors and patients, and we’ll have more to say about our work in this area in 2017. Technology has always helped define how people create and share media — consider the printing press, film or the electric guitar. Last year we started a project called Magenta to explore the intersection of art and machine intelligence, and the potential of using machine learning systems to augment human creativity. Starting with music and image generation and moving to areas like text generation and VR, Magenta is advancing the state-of-the-art in generative models for content creation. We’ve helped to organize a one-day symposium on these topics and supported an art exhibition of machine generated art. We’ve explored a variety of topics in music generation and artistic style transfer, and our jam session demo won the Best Demo Award at NIPS 2016. As we develop more powerful and sophisticated AI systems and deploy them in a wider variety of real-world settings, we want to ensure that these systems are both safe and fair, and we also want to build tools to help humans better understand the output they produce. In the area of AI safety, in a cross-institutional collaboration with researchers at Stanford, Berkeley, and OpenAI, we published a white paper on Concrete Problems in AI Safety (see the blog post here). The paper outlines some specific problems and areas where we believe there is real and foundational research to be done in the area of AI safety. One aspect of safety on which we are making progress is the protection of the privacy of training data, obtaining differential privacy guarantees, most recently via knowledge transfer techniques. In addition to safety, as we start to rely on AI systems to make more complex and sophisticated decisions, we want to ensure that those decisions are fair. In a paper on equality of opportunity in supervised learning (see the blog post here), we showed how to optimally adjust any trained predictor to prevent one particular formal notion of discrimination, and the paper illustrated this with a case study based on FICO credit scores. To make this work more accessible, we also created a visualization to help illustrate and interactively explore the concepts from the paper. In November 2015, we open-sourced an initial version of TensorFlow so that the rest of the machine learning community could benefit from it and we could all collaborate to jointly improve it. In 2016, TensorFlow became the most popular machine learning project on GitHub, with over 10,000 commits by more than 570 people. TensorFlow’s repository of models has grown with contributions from the community, and there are also more than 5000 TensorFlow-related repositories listed on GitHub alone! Furthermore, TensorFlow has been widely adopted by well-known research groups and large companies including DeepMind, and applied towards or some unusual applications like finding sea cows Down Under and sorting cucumbers in Japan. We’ve made numerous performance improvements, added support for distributed training, brought TensorFlow to iOS, Raspberry Pi and Windows, and integrated TensorFlow with widely-used big data infrastructure. We’ve extended TensorBoard, TensorFlow’s visualization system with improved tools for visualizing computation graphs and embeddings. We’ve also made TensorFlow accessible from Go, Rust and Haskell, released state-of-the-art image classification models, Wide and Deep and answered thousands of questions on GitHub, StackOverflow and the TensorFlow mailing list along the way. TensorFlow Serving simplifies the process of serving TensorFlow models in production, and for those working in the cloud, Google Cloud Machine Learning offers TensorFlow as a managed service. Last November, we celebrated TensorFlow’s one year anniversary as an open-source project, and presented a paper on the computer systems aspects of TensorFlow at OSDI, one of the premier computer systems research conferences. In collaboration with our colleagues in the compiler team at Google we’ve also been hard at work on a backend compiler for TensorFlow called XLA, an alpha version of which was recently added to the open-source release. We also strive to educate and mentor people in how to do machine learning and how to conduct research in this field. Last January, Vincent Vanhoucke, one of the research leads in the Brain team, developed and worked with Udacity to make available a free online deep learning course (blog announcement). We also put together TensorFlow Playground, a fun and interactive system to help people better understand and visualize how very simple neural networks learn to accomplish tasks. In June we welcomed our first class of 27 Google Brain Residents, selected from more than 2200 applicants, and in seven months they have already conducted significantly original research, helping to author 21 research papers. In August, many Brain team members took part in a Google Brain team Reddit AMA (Ask Me Anything) on r/MachineLearning to answer the community’s questions about machine learning and our team. Throughout the year, we also hosted 46 student interns (mostly Ph.D. students) in our group to conduct research and work with our team members. In addition to the public-facing activities outlined above, we have continued to work within Google to spread machine learning expertise and awareness throughout our many product teams, and to ensure that the company as a whole is well positioned to take advantage of any new machine learning research that emerges. As one example, we worked closely with our platforms team to provide specifications and high level goals for Google’s Tensor Processing Unit (TPU), a custom machine learning accelerator ASIC that was discussed at Google I/O. This custom chip provides an order of magnitude improvement for machine learning workloads, and is heavily used throughout our products, including for RankBrain, for the recently launched Neural Machine Translation system, and for the AlphaGo match against Lee Sedol in Korea last March. All in all, 2016 was an exciting year for the Google Brain team and our many collaborators and colleagues both within and outside of Google, and we look forward to our machine learning research having significant impact in 2017! In October 2015 we launched the Google Brain Residency, a 12-month program focused on jumpstarting a career for those interested in machine learning and deep learning research. This program is an opportunity to get hands on experience using the state-of-the-art infrastructure available at Google, and offers the chance to work alongside top researchers within the Google Brain team. Our first group of residents arrived in June 2016, working with researchers on problems at the forefront of machine learning. The wide array of topics studied by residents reflects the diversity of the residents themselves — some come to the program as new graduates with degrees ranging from BAs to Ph.Ds in computer science to physics and mathematics to biology and neuroscience, while other residents come with years of industry experience under their belts. They all have come with a passion for learning how to conduct machine learning research. The breadth of research being done by the Google Brain Team along with resident-mentorship pairing flexibility ensures that residents with interests in machine learning algorithms and reinforcement learning, natural language understanding, robotics, neuroscience, genetics and more, are able to find good mentors to help them pursue their ideas and publish interesting work. And just seven months into the program, the Residents are already making an impact in the research field. To date, Google Brain Residents have submitted a total of 21 papers to leading machine learning conferences, spanning topics from enhancing low resolution images to building neural networks that in turn design novel, task specific neural network architectures. Of those 21 papers, 5 were accepted in the recent BayLearn Conference (two of which, “Mean Field Neural Networks” and “Regularizing Neural Networks by Penalizing Their Output Distribution’’, were presented in oral sessions), 2 were accepted in the NIPS 2016 Adversarial Training workshop, and another in ISMIR 2016 (see the full list of papers, including the 14 submissions to ICLR 2017, after the figures below). An LSTM Cell (Left) and a state of the art RNN Cell found using a neural network (Right). This is an example of a novel architecture found using the approach presented in “Neural Architecture Search with Reinforcement Learning” (B. Zoph and Q. V. Le, submitted to ICLR 2017). This paper uses a neural network to generate novel RNN cell architectures that outperform the widely used LSTM on a variety of different tasks. The training accuracy for neural networks, colored from black (random chance) to red (high accuracy). Overlaid in white dashed lines are the theoretical predictions showing the boundary between trainable and untrainable networks. (a) Networks with no dropout. (b)-(d) Networks with dropout rates of 0.01, 0.02, 0.06 respectively. 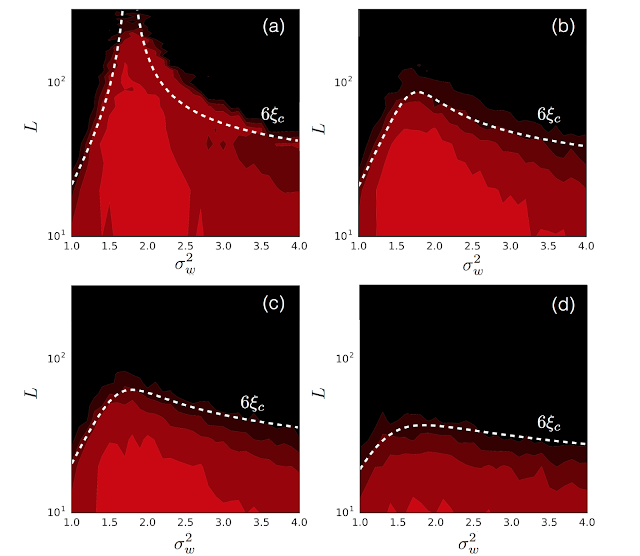 This research explores whether theoretical calculations can replace large hyperparameter searches. For more details, read “Deep Information Propagation” (S. S. Schoenholz, J. Gilmer, S. Ganguli, J. Sohl-Dickstein, submitted to ICLR 2017). The diverse and collaborative atmosphere fostered by the Brain team has resulted in a group of researchers making great strides on a wide range of research areas which we are excited to share with the broader community. We look forward to even more innovative research that is yet to be done from our 2016 residents, and are excited for the program to continue into it’s second year! We are currently accepting applications for the 2017 Google Brain Residency Program. To learn more about the program and to submit your application, visit g.co/brainresidency. Applications close January 13th, 2017.